Volume weighted average price is the market’s best-kept secret. Very few traders use it — and almost none use it correctly. Successful trading isn’t as simple as some people would have you believe — it requires a thorough understanding of the markets and an intuitive strategy. Stop playing checkers. This is chess. Everything you need to know about the market’s most underutilized indicator. What is VWAP and why should you care? Personalized, live education from VWAP specialist and expert mentor, Zach Hurwitz. Learn every aspect of the strategy that I’ve created and cultivated over the past five years. Gain access to the most powerful weapon in my arsenal, the VWAP Real-Time Scanner, and a growing community of VWAP traders. Includes a live coaching room, webinars, and an extensive chart library. Zach has been a successful full-time trader since graduating from Tufts University in 2008 and has coached 300+ traders over the last three years. He has consulted with emerging hedge funds and proprietary trading firms and has appeared numerous times on the ChatWithTraders and TradingStory podcasts. Five years ago, Zach dedicated his trading life to studying volume-weighted average price [VWAP] and building his own strategy around it, having finally found the success all independent traders are seeking — an indicator to make sense of an otherwise chaotic, unpredictable market. Professional traders use VWAP everyday. Why aren’t you? Just as the name implies, Dashboard contains several useful VWAP metrics like price in relation to VWAP ($, %, and StDev), viable position sizing (based on user-defined targets), and typical VWAP daily movement. Each metric can be hidden (or shown) from the Dashboard’s customization window. 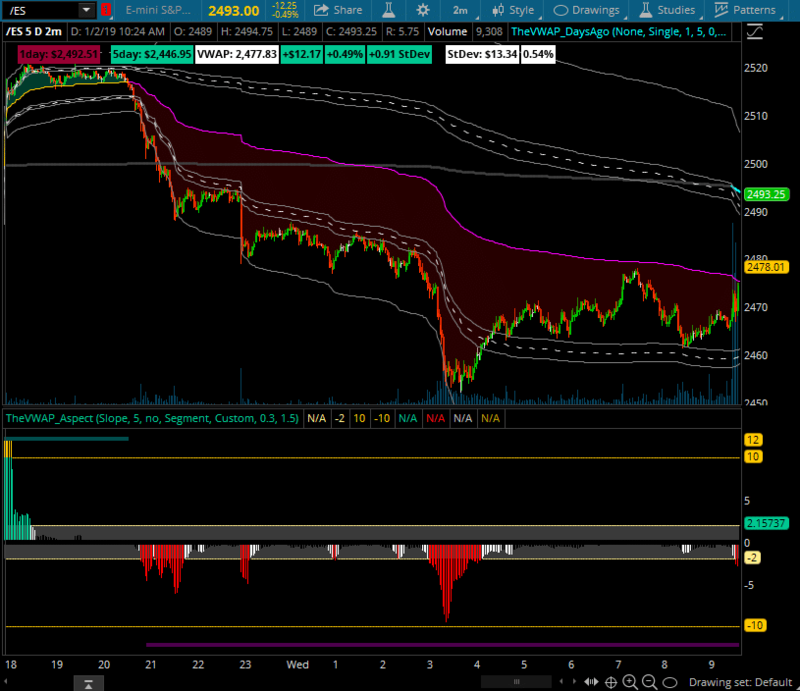 TheVWAP’s custom version of standard, intraday Volume-Weighted Average Price. Includes multiple standard deviation band inputs and color-coding to reflect the market’s current position and slope. Intraday is an essential visual reference point, serving as the foundation for the four primary trade setups covered in the course.